The Norwegian Mountain Festival in Åndalsnes in Romsdalen is the summer festival for all mountain and outdoor pursuits enthusiasts. The festival aims to bring together people with a common love of mountains and nature. Varied programme with extreme challenge, peak climbing, hikes, family events, cultural evening, youth camp, sailing trips, courses and mountain farm days. An invitation to participate in the Norwegian Mountain Festival in Romsdalen came to me in a period when I worked mostly with video. When I realized that the place I was going to exhibit was the ridge of the Litlefjellet mountain which had no electricity, I thought of an alternative course. 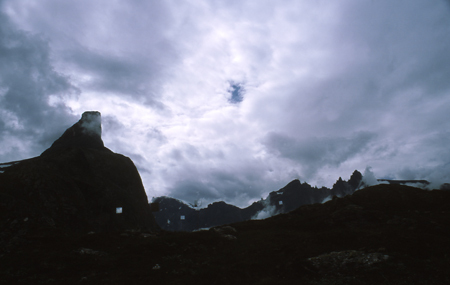 Climbing up and seeing the majestic beauty of surrounding mountains, I began struggling with doubt. The art project, I further realized, could become a disturbing intervention. However, as it turned out, there was wind, an energy I needed to work with "moving images" on top of the mountain. I decided to use several Plexiglas mirrors. Each Plexiglas as an aesthetic material was made to work as a kind of monitor. The difference between video monitors and mirrors is so obvious. Video projects create content, while mirrors absorb. Mirrors do not “talk”, they “listen” to the mountains. The work’s simplicity and lack of open intellectual speculation behind the idea gave a direct aesthetic experience of the mountains. All these different factors led to interesting conversations with passing tourists. The mirrors were mounted on metal rods in such a way that the wind could rotate them. 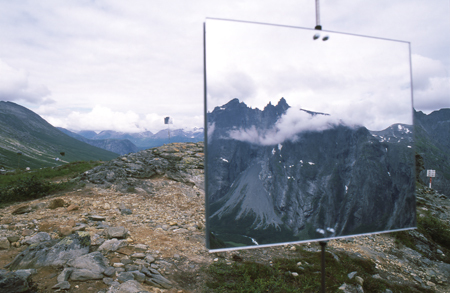 With the nearby Romsdalshorn peak and Trollveggen as background, ten mirrors placed on the ridge of Litlefjellet created a new dimension of depth in the landscape. Because of long distances between mountains and their reflections, mirrors became huge holes or kinds of bent tunnels relaying a 360 degrees reality of "space-time". In a sense, these mirrors became kinds of Einsteinian Wormholes also known as Einstein–Rosen Bridges. One could look into these holes and feel that it was possible to go inside. One got the impression that one could go into the wormhole and emerge behind oneself, as if coming out of and from one’s back. 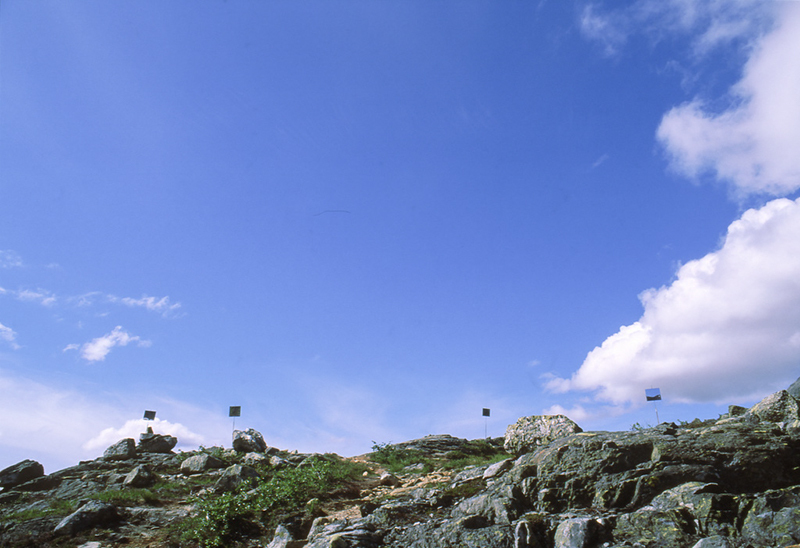 The installation gave mountains lightness and freedom to move and jump over the Romsdalen valley. The effect was that the mirrors rearranged the landscape, creating the impression that mountains were moving, and changing places, to their opposite sides. 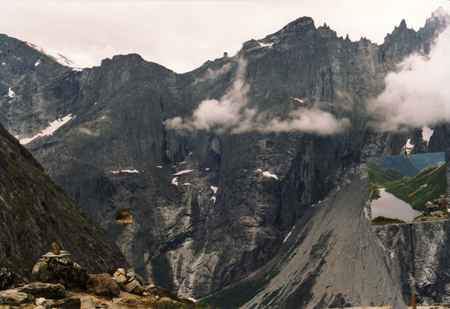 Not least, for the first time, some of the most beautiful mountains in Norway could “look” at their beauty. The Litlefjellet ridge divides the landscape into two. I experienced, that we, who were on the ridge, stood in the middle of an open book with pages to the left and right. Today, the installation exists only in the form of photographic documentation. Photographs have transformed the multidimensional space to pictorial surfaces. What were on the left and right are merged together. I look at the photographs, I feel as if the book has been closed.